Regardless of ABC’s Managing Director Michelle Guthrie’s advertised glowing business acumen with other companies it seems the broadcasting behemoth is either a beast she can’t control or she is simply way out of her depth. In either case Guthrie should pack up and move on. The ABC has now become a joke through its foolish failures. The culture within is nurturing incompetent players at hideously high cost to taxpayers, all because management is equally incompetent in the mire of mediocrity they have spawned. 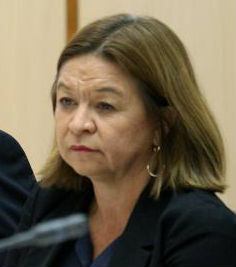 The recent Senate Estimates hearing into the ABC, where managing director Michelle Guthrie and others were left floundering, unable to answer basic questions about what everyone knew would be the central topic — chief economics correspondent Emma Alberici’s contested articles about tax policy — will go down as the worst performance by ABC management in recent times. Coming soon to your ABC, a spicy new Sunday night drama: Senate Estimates — Alberici’s Revenge. Here’s the plot. A plucky, yet highly respected business and finance journalist (and three-time Walkleys finalist #justsayin), played by Miss Fisher’s Murder Mysteries’ star Essie Davis, dares to tell the truth about government tax policy, finding her only friend is a cool-headed Labor senator (Marta Dusseldorp) who reaches across the Sky News-ABC divide to shame faceless TV executives who try to hang our gal out to dry. ABC managing director (Noni Hazlehurst) and editorial policy director (Hugo Weaving) wither under the Senate estimates glare. Co-funded by Netflix. In contrast, new Labor Senator Kristina Keneally, at her first estimates appearance, delivered a belter. Keneally just happens to be the best informed former Sky News presenter in history about ABC editorial processes, even knowing extraordinary detail about the original submitted versions of Alberici’s articles. To be fair, there is no evidence that Alberici gave any politician any information either directly or through an intermediary about the ABC’s inadequate editorial procedures, which Aunty has been forced to revise. Keneally, when contacted, remarked on the irony of a journalist ringing up to demand the identity of sources. Passages in the Estimates transcript are breathtaking for the ABC’s admissions of ignorance, often delivered by editorial policy director Alan Sunderland, who agreed to take many questions on notice about Alberici’s articles, which the ABC published on Valentine’s Day. But if we are to look upon this sorry journalistic chapter as the ABC’s St Valentine’s Day massacre, it is unclear how high the body count will be. Certainly, Alberici feels that she has been thrown under a bus. And at Estimates, Guthrie appeared to issue a public dressing down to ABC News communications lead Sally Jackson (a former media writer for The Australian), by revealing that Jackson had posted on Facebook a statement she had not authorised. Jackson posted the ABC responses to answers provided to both this newspaper andThe Australian Financial Review on her personal Facebook page. “That shouldn’t have happened,” Guthrie said. And she couldn’t say whether ABC news director Gaven Morris had authorised the statement. Morris was the one man with answers to many of the senators’ pesky questions, but he was the Macavity the Mystery Cat of the estimates process. I am not sure why, and found his absence curious, to say the least. ABC news directors, I am told, do not usually attend Senate Estimates. But Morris’s predecessors Kate Torney and John Cameron attended when the occasion warranted it. Maybe the senators could request Morris’s appearance at the spillover session they will call in April. Why does any of this matter? ABC News, and the entire corporation, is midway through the Guthrie revolution. Staff are moving into different divisions, and content is to be platform-neutral, living equally online and on trad­itional TV and radio platforms. But any reorganisation is unsettling and has teething problems. And in two journalistic set pieces this year — the secret cabinet documents found in an old filing cabinet and this investigation into company tax — ABC News stumbled badly. The filing cabinet files produced a raft of not very interesting stories and sloppy editorial processes (again) led to the ABC enduring the hideous embarrassment of having to apologise to former prime minister Kevin Rudd for a pretty serious slur on his reputation. In her opening statement to the committee, Guthrie said editorial restructures were the problem. She detailed the changes to editorial management the ABC had hastily put in place. It may well be that come April Morris will feel the pressure. Or that the issues of “impartiality” and “accuracy” the ABC ominously referred to in its previous public statements come glaringly to light in a way that heaps further embarrassment upon Alberici. But for the ABC to have the chaos of its innermost editorial processes exposed for all to see is a place no news organisation ever wants to be. I guess you can’t sack them all….. but 20-30 would be a good start. with the left bias at the ABC and the heavily green tinge of its players, there was never going to be any real STARS. Said before and I say again, 100% de-fund the ABC and SBS, flog off the assets and move on. This is one asset sale which will be of benefit to Australians, unlike the flog off of essential services. Guthrie doesn’t give Blogs a Woody. You’re a man of letters, DB. As I said before cut their budget to match their audience size to 30% of $1.5 billion! Now that is a saving. Literal translation of famous Chinese proverb: Don’t put food in the mouth of those kicking you in the nuts at the same time. Applies to the ABC. Meanwhile, in the USA, the Trumpster is pushing back by treating the nutcracker ‘sweets’ (Public Broadcasting Services) to a food strike…. yuuuge funding cuts! The kickees are naturally outraged and are demanding that the ‘free food’ be continued while they continue to put the boot in. Why should the ABC be run any differently to every other Government institution? Wake up guys, most Government run operations couldn’t find their arse using both hands. The whole Public service needs a huge enema or at least a Royal Commission. Nice description of socialism’s outcomes, Phil. Previous post: If you were Mr Trump what would you do?